암호화폐(가상화폐) 세이프 익스체인지 코인(SAFEX) 이 새로운 메인넷을 출시한다. 9일(한국시간) 코인마켓캘린더(Coinmarketcal.com)에 따르면 세이프 익스체인지 코인은 오는 10일(현지시간) 메인넷을 출시하는 것으로 알려졌다. 세이프 익스체인지 코인은 역사상 처음으로 상거래 패러다임을 암호화폐 및 블록체인 상거래로 전환시켜 놓은 분권형 마켓플레이스 이다. 한편 세이프 익스체인지는 이날 코인마켓캡에서 전일 대비 5.20% 떨어진 0.0215달러에 거래되고 있다. Safe Exchage Coin(SAFEX) will be launched a New Mainnet. 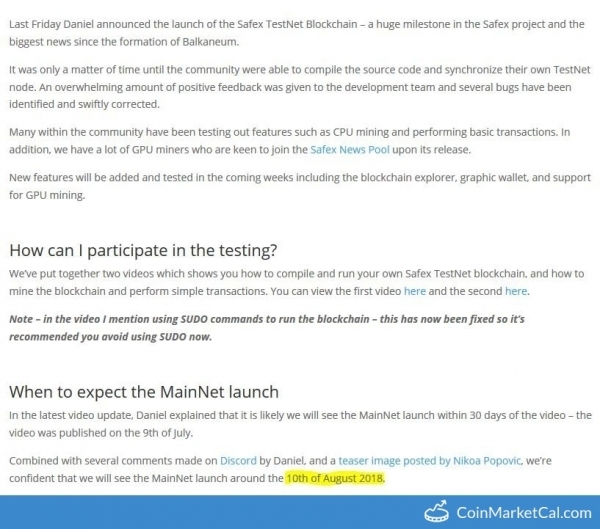 According to the Coin Market Calendar(coinmarketcal.com) on the 9th(Korea time), SAFEX reproted to start launching a mainnet on the 10th(local time). Safe Exchange Coin is a decentralized marketplace that for the first time in history shifts paradigm of trade towards cryptocurrency and blockchain commerce. SAFEX is traded at 0.0215 dollars, down 5.20 percent on coinmarketcap from the previous day.